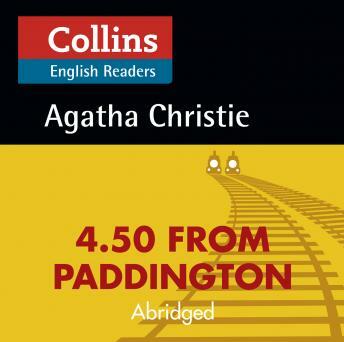 Listen to "4.50 From Paddington: B2" on your iOS and Android device. Agatha Christie is the most widely published author of all time and in any language. Now Collins has adapted her famous detective novels for English language learners. These carefully abridged versions are shorter with the language targeted at learners of English. A woman is murdered on a train. and asks her to go undercover to investigate, Lucy quickly accepts the challenge! Who is the dead woman? What was the motive for her murder? And why was the body thrown from the train and later hidden at Rutherford Hall? When a second murder takes place, everyone at Rutherford Hall seems in danger, so Miss Marple sets a trap to catch the murderer.